Hey guys! You know those pretty pictures of swirling galaxies and nebulas and stars and other pretty space stuff? I always love looking at the colours and pretty patterns so I thought I would try using them as a nailart inspiration! You can find a lot of space manicures floating around on the internet, and a lot of different techniques for making them. I did mine using a sponge and the following polishes: P2 - Virgin, Orly - Winter wonderland, Orly - Lunar eclipse, Zoya - Adina, CND effects - Violet shimmer and an unnamed glitter by 2B all over A-England - Camelot as a base. 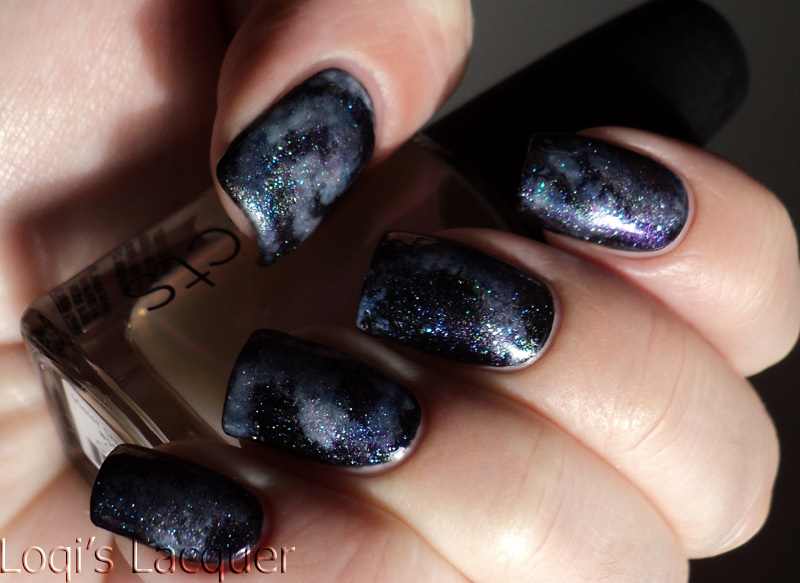 I started out with Virgin (a sheer white) and Winter wonderland and stamped swirly patterns and wispy clouds over the black, making it look like the swirly galaxies and nebula formations. Then I used the other colours to apply sheer washes of colour in random places. I didn't cover the entire nail with all the colours, but tried to make irregular shapes. 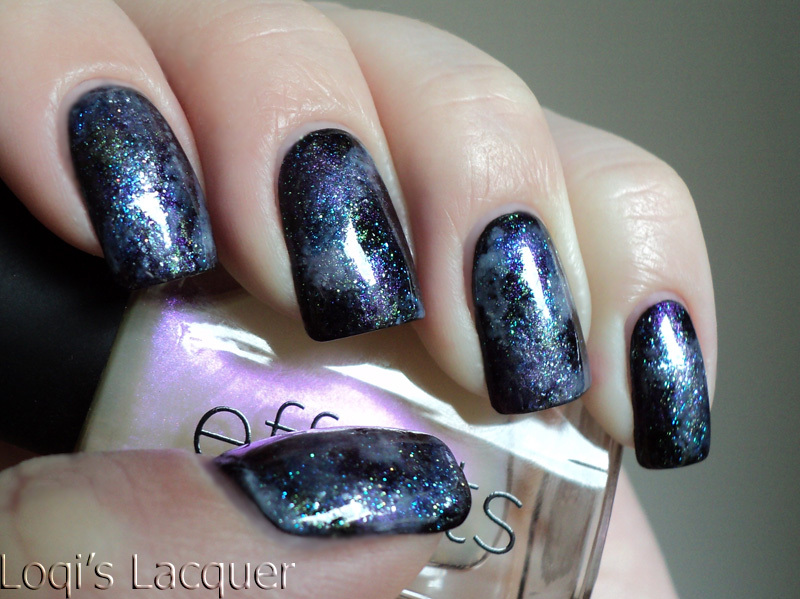 Then I topped the whole thing of with a thin layer of the fine glitter polish to act as stars and this was the result! I like the duochrome that Adina and Violet shimmer brought to the mix and the way the milky looking clouds and swirls turned out, but I do think it's a little bit too chaotic for my tastes. I also think that if I try this again I won't top it off with the glitter, it could do with a bit less star-bling ;) what do you think? I love this! I think the glitter looks great... the whole mani looks great. However if you thought the glitter to strong maybe spong it on as well? IMO you did everything perfect though. 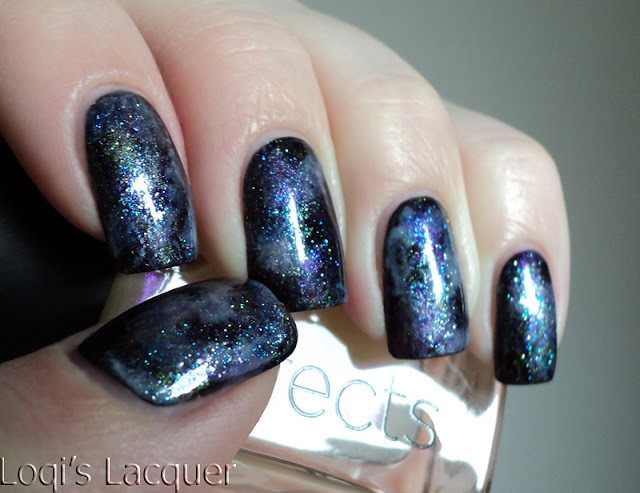 This is absolutely "galactic"! I really love it..IMO it is gorgeous this way..
Noooo I just love the star-bling !! :D Morrrrre star-bling O+ What a wonderful mani ! I can only think <333 right now. I think it is perfect! I would love to have this mani! WOW!